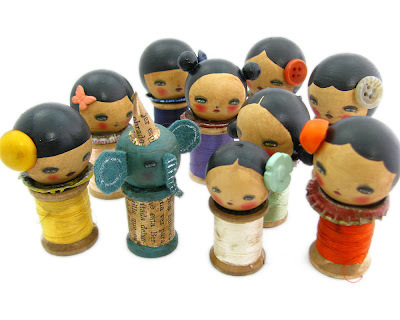 The dolls were created with vintage wood spools of thread and wooden heads, embellished with old bottle caps and vintage buttons. Each one is one of a kind and they're available at my shop right now! And I was the feature artist this month in the PFATT Marketplace and I'm offering this beautiful angel available exclusively here. Wow, love the painting....so beautiful! Congrats on the cover of the latest issue of Art Quilting Studio! I was at an estate sale a while back and saw a bag of alphabet blocks, I said to my sister - what could I do with these? I was brain-dead that day and didn't get them. Of course you knew what to do with blocks! SO CUTE! Love Love Love them! Cute, Cute Cute and more cute!!!!! Son encantadoras Danita, chica!! que trabajadora eres. El elefantito tambien es precioso. Oh my goodness! I love your work! Especially those little wooden girls!! More please!! Hola Danita! Thanks for your visit and comment! Love love your new work it's all soooooooooo fabulous!!! 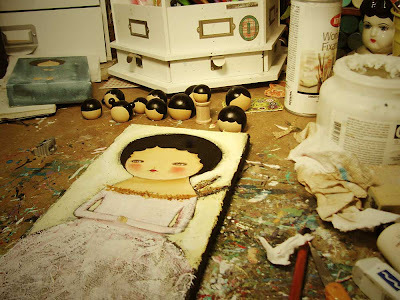 oh I just adore the doll at the bottom:) lovely lovely! How come I've never seen this before.. fabulous stuff! Danita these are so cute!! Muy bonita! Feliz año nuevo!! Nos debemos un nuevo intercambio!!! !